The Minimum Wage (Spanish) is a minimum wage law poster by the Rhode Island Department Of Labor and Training. This is a mandatory posting for all employers in Rhode Island, and businesses who fail to comply may be subject to fines or sanctions. This poster, written in Spanish, must be posted in a conspicuous place by all employers so that all Spanish speaking employees can see it. This poster describes what the minimum wage is, who is exempt from the minimum wage, how overtime pay is calculated, restrictions on child labor, minimum shift hours for employees requested or permitted to report for duty at the beginning of a work shift, and information on how this law is enforced. It appears you don't have a PDF plugin for this browser. 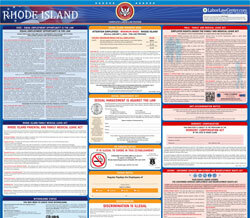 Please see the link below to download rhode-island-minwageposterjan19span.pdf. discreción del Director de Labor y Training. por un cumplimiento o circunstancias por emergencias. horas de trabajo los Domingos y los dias Feriados. aplican a los trabajos agrícolas. constribuye a una violación separada.